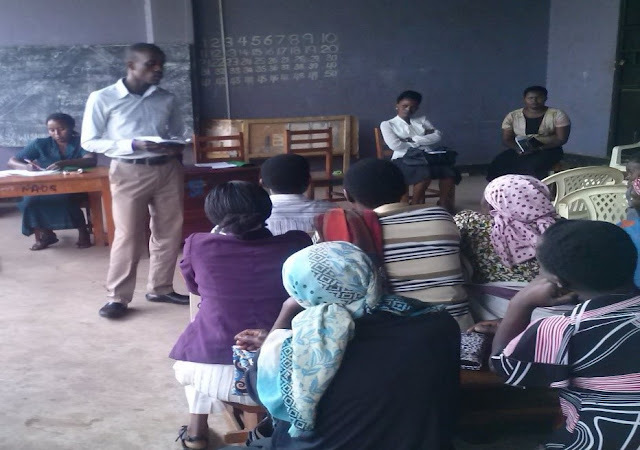 The Nyaka AIDS Orphans Project: Meet Nyaka's New Social Worker! Meet Nyaka's New Social Worker! I was born in Uganda and come from a humble family. I was raised in a hardworking environment where I involved myself with educated people who contributed to who I am today. In 2012 I received a Bachelor’s degree in Guidance and Counseling at Kyambogo University in Uganda. In addition, I undertook a Diploma in the Virtual Leadership Development Program for family planning and reproductive health services. I previously worked as an HIV/AIDS Counselor with Action Africa Help-International (Uganda Program)-UNHCR Implementing partner at Kyangwali Refugees Settlement, Volunteered at Reproductive Health Uganda-Head Office, and worked as a Peer Educator at Alliance of Mayors and Municipal Leaders on HIV/AIDS in Africa. At Nyaka AIDS Orphans Project, as a Social Worker, I have been offering guidance to students; providing psychosocial support to children, grandmothers and community members; following up on sexual assault cases at the Police, Court, Resident State Attorney’s Office, and Probation Office; and ensuring that victims are medically examined. By working closely with others, I plan to engage the community structures to be part of the cause to end sexual abuse in the community. I have community dialogues and discussions about sexual reproductive health issues and form community groups to disseminate information on sexual assault. The problems I’m trying to address is the low response of some community members to report sexual assault cases to the Police and also delayed response by medical officers to examine victims. I’m designing standard operating procedures to manage sexual abuse cases and creating more collaboration networks with other NGO’s and the law enforcing agencies. I believe that each person has equal opportunities to succeed in life. The process of changing attitudes and beliefs about sexual assault is slow and requires support from the community. John will ensure that students have someone safe to talk to and will teach all students age appropriate information about the best ways to stay safe and what to do if they are attacked. He is a valuable team member and we welcome him to the Nyaka Family.